Help your students pursue their dreams. In partnership with Wishbone, Advocates have raised $4,158,601 to send 2176 outstanding low-income students to high-quality summer programs. Students are more engaged when they can pursue their passions. Yet low-income students represent less than 2% of enrollment in high-quality summer programs. We're on a mission to change that. We negotiate scholarships, maintain a database of programs, and provide an online platform for students to crowdfund their education. But we need your help. We provide all the tools you need to create a crowd-funded campaign to raise money and send your student to a high-quality summer program. It was a big deal for Sarah to overcome her shyness and travel to San Francisco, take college art classes and challenge herself to learn new material. She feels more well-rounded in her art skills, more creative, and more independent and responsible – which is great for her preparation to go to college next year! She helped Sarah raise $750 to attend Academy of Art University. My students have re-entered high school with increased confidence and momentum towards college. They were deeply inspired by the friends they made and the faculty they met, and are working hard to make sure they will be eligible to attend these institutions in just a few short years. She helped Etije raise $2,500 to attend Discover Hopkins at John Hopkins University. As someone who knows your students and their personalities best, we rely on your letter of recommendation as we evaluate applications. As an Advocate, you will also help your students gain access to a wider fundraising network by sharing their campaigns with your friends and family. Wishbone Advocates have two responsibilities: 1. Submit a recommendation on behalf of your student 2. Share your student’s campaign with friends and family via social media and email to fundraise your student's program costs. 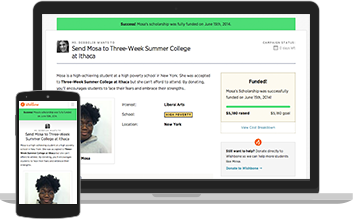 Wishbone enables program affordability through exclusive scholarships from program partners and negotiated corporate and foundation sponsorships, which reduces the total tuition costs left to fundraise. Not quite ready? Learn more.